With the availability of version 0.13, it becomes trivially easy to use NW.js with the Johnny-Five robotics library. Combined with a microcontroller such as the Arduino, you get a very powerful end-to-end toolchain for physical computing. In this tutorial, we will show you how easy it has become to control external devices and gather data from sensors in such an environment. To play along, you will need a board that is supported by the Johnny-Five library. We will use an old Arduino Duemilanove but pretty much any Arduino will do just fine. Even models that are not officially supported may just work. This is the case with our Duemilanove. How to load Firmata on your board will depend on its type. The procedure below is for Arduino-compatible boards. If you have another type of microcontroller that is supported by Johnny-Five, check with its manufacturer for specific instructions. Plug in your microcontroller. If you are using a no-name Arduino clone, you may have to install a driver. Check with your reseller. Select your board type (Tools > Board), processor (Tools > Processor) and port (Tools > Port). Open the StandardFirmata sketch (File > Examples > Firmata > StandardFirmata). Click the Upload button (arrow pointing right). Once it says “Done uploading”, you are all set. Your microcontroller is now running Firmata as its default program. Since the program is kept in the non-volatile Flash memory, you only need to do this once. It will remain on the device even when you power it down. Please note that this will only work with Johnny-Five version 0.9.20 and later. In order for Johnny-Five to use the newly available chrome.serial API, it needs to use the browser-serialport module instead of the node-serialport module. To do that, Johnny-Five and one of its dependencies (Firmata) needed to be modified. For this reason, I submitted a tiny code change for Johnny-Five and another one for Firmata. Those changes have been made available on NPM since late February 2016. Now, we should be all set. Let’s code. You can find out the COM port number in the Arduino IDE or by going to the system’s device manager. All that is left, is to launch our project. There are various ways to do this. The easiest (albeit messy) way is to download NW.js (latest version, SDK flavor) and put all the uncompressed files directly inside the project folder. Then, simply run or double-click nwjs.app (Mac), nw.exe (Windows) or nw (Linux). For cleaner ways to run an NW.js application, check out the How to Run Apps article in the NW.js wiki. If everything went well, the onboard LED should blink steadily. The onboard LED is near output 13. In fact, if you connect a LED to output 13 (long leg in 13, short leg in GND), they will blink together. If you have made it this far, it means your environment is working properly. You are ready to build your first project. As a first project, we will build a Theremin’ish instrument. To do so, we will gather distance data with a Sharp distance sensor and we will use that data to play a sound by using a piezo buzzer. Although this is a very simple demo, if you successfully make it to the end, you will know enough to attack much larger projects. As you will see, Johnny-Five’s API is very straightforward. Then, in the already-existing “on ready” callback function, let’s create a new Proximity object. To do so, we must specify two things: the type of sensor and the input it’s connected to. Ours is the “GP2Y0A02YK0F” and it’s connected to analog input 0 ( A0). If you have a different model, check out the Proximity object’s API documentation. Moving your hand in front of the sensor should modify the output. Yeah! For the buzzer to emit a sound, we must use one of the digital outputs supporting PWM. Those can be usually be identified by a wave-shaped icon (~) or simply the letters PWM. If you want to learn what PWM means, check out the PWM article on Arduino’s website. If you run that, you should now hear the buzzer play a sound at a pitch that matches your hand’s distance from the sensor. Obviously, the 1$ piezo buzzer does not produce an exquisite tone. However, the key here is recognizing that you are now able to use sensors to gather data and you are also able to control external devices. When you stop to think about it, that’s pretty amazing! As you browse through Johnny-Five’s API, you will realize that most input and output components are not harder to use than the distance sensor and the buzzer used in this demo. 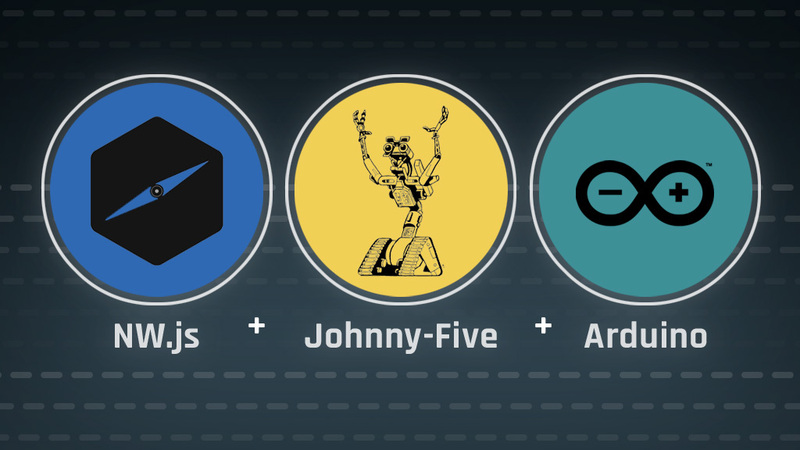 Just find the right hardware and you can do amazing stuff with NW.js, Johnny-Five and Arduino. If you want, you can download this demo’s source code directly. Beware that, to remain within a reasonable size, the zip file does not contain the node_modules folder or NW.js. The schematics in this article have been created with Fritzing. I changed the link. Thanks for pointing it out, Jeff. I didn’t understand the reason for using NW.JS as opposed to plain node.js. I think NW.JS would be useful if there was some UI to show. I think NW.JS would be useful if there was some UI to show. That’s precisely the idea. Generally, one would use Johnny-Five to control a robot and no interface would be necessary. However, if you want to use Johnny-File in a physical computing context, having a UI or visual output might be the whole point. If I create an interactive installation for a museum, I could retrieve information from visitors (position, height, number, etc.) via Johnny-five and use that to control what is projected on the screen in front of them. Even for robots, it might be very useful to have a control panel where you can adjust various parameters. I hope this makes it clearer. I’m not sure why you are getting such output. Did you check the documentation? There’s even an example with your exact setup. I got it to work using the example . thanks again! 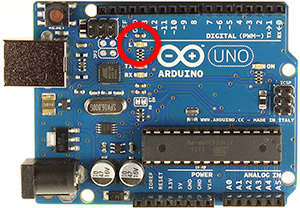 Could the Arduino also be programmed with this serial port access? I’m not sure I understand your question… To use Johnny-Five, Firmata must be installed on the Arduino. If you want a custom program on the Arduino while still using Johnny-Five, I guess you would have to customize the Firmata sketch.